Cretan Nectar is the oldest traditional vinegar-making factory based on the island of Crete. It produces, bottles and distributes not only traditional vinegar but also innovating products such as Hot Spicy Vinegar and Balsamic Vinegar Drink. 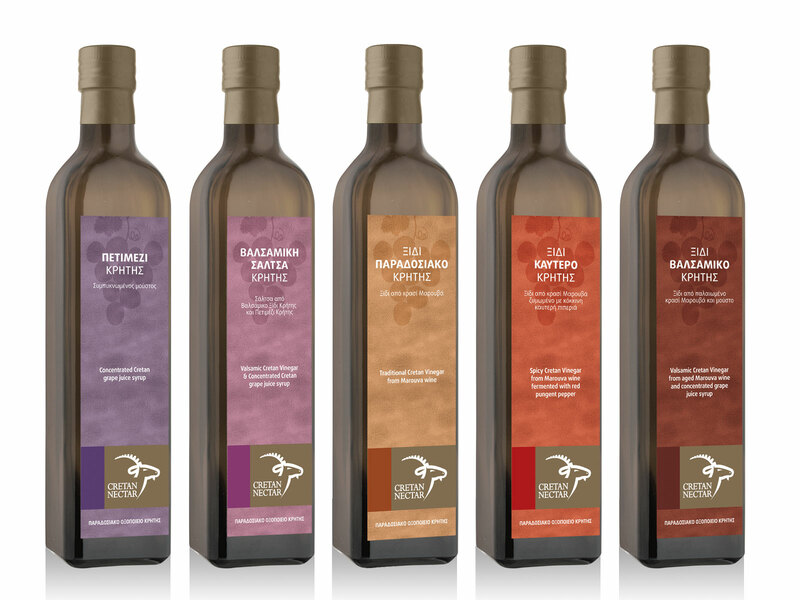 In 2009, Cretan Nectar confederated in the Vinolio Creta group of companies, making the re-designing of its corporate identity obligatory. This was essential in order for the company to be up to date with the contemporary image of Vinolio Creta and also, to be able to successfully face the continuously growing competition and variety of traditional products. busy-b took on the project of bringing the company’s vision to life by designing the logo and the packaging for a range of unique products. We chose the animal Capra Aegagrus Creticus as a symbol-logo of the company, because it is a type of wild goat that lives exclusively on the mountains of Crete, thus creating a clear and unique identity that enhances the purity of the product. We designed it in a style that gives a modern dimension to a traditional product. The colour range used is inspired by the colours of the rocks where Capra Aegagrus Creticus lives, a fact that further reinforces the authenticity of the proposal.